Mrs. Mary Bell Stocks Alexander, age 78, of Rockmart, GA passed away Monday, April 8, 2019 in a Rome medical center. She was born in Rockmart, GA on April 21, 1940, daughter of the late James A. Pollard and the late Helen Cook Pollard. Mrs. Alexander lived her childhood and early adult life in Rockmart before moving to Indianapolis, IN where she made her home for thirty years. Mrs. Alexander moved back to Rockmart in the early 1990's where she has lived until her passing. She was a faithful member of the Morning Star Baptist Church of Rockmart where she was active in the church choir. She enjoyed bowling, bingo and watching Family Feud on the Game Show Network. In addition to her parents she was preceded in death by her previous husband of 33 years, Joe Lewis Stocks. 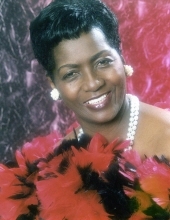 Survivors include her three children: Ronnie Jerome Stocks and his wife Lisa, IN, Shirlene Hudson and her husband Clarence, Rockmart and Brian Stocks and his wife, Angel, Rome; nine grandchildren; five great grandchildren; sister, Barbara Williams, Rockmart; surviving brothers and sisters from Ohio; numerous nieces and nephews and special former husband, MacArthur (Mack) Alexander. Homegoing services will be held Saturday, April 13, 2019 at 1:00 PM in the Morning Star Baptist Church with Rev. Donald White and Rev. Susan Buckson Green officiating. Interment will follow in Rose Hill Cemetery. Mrs. Alexander will be taken to the church where she will lie instate on Saturday from 12:00 noon until the funeral hour. Pallbearers will include: Chaz Johnson, Clem Williams, Willie Barkley, Devonta White, Felex McClure, Forest Cooper and Joshua McClure. The family will receive friends Friday evening from 6:00 until 8:00 PM at the funeral home. The Alvis Miller & Son Funeral Home & Crematory of Rockmart is in charge of arrangements for Mrs. Mary Bell Stocks Alexander. To send flowers or a remembrance gift to the family of Mary Bell Stocks Alexander, please visit our Tribute Store. "Email Address" would like to share the life celebration of Mary Bell Stocks Alexander. Click on the "link" to go to share a favorite memory or leave a condolence message for the family.